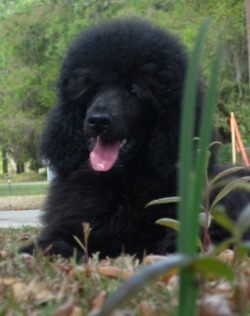 Boshi Standard Poodles in Florida - Standard poodle puppies for sale: Healthy black puppies. White puppies occasionally. Available now. Begin the process of securing your Boshi Baby by filling out the Puppy Questionnaire at the bottom of this page. A deposit is required to hold a puppy. Our waiting list has already started. See slide show of some of our past puppies below! Our ability to interact with the puppies 24/7 guarantees a well-developed and socialized pet. Having a better grasp on their personalities enables us to best match the puppies to their new owner. Since we know each puppy so well, their temperaments and personalities, we are best suited to make these decisions. That also eliminates conflict when multiple people would prefer the same puppy. Please contact us to learn more about the health testing on the parents, puppy vaccinations, limited registration and our spay/neuter contract as you search for your new family member. All puppies are sold as pet/companion puppies on a spay/neuter contract and are sold on limited registration only. That means a puppy can be registered with AKC but cannot be used for breeding. They will come with AKC Registration Applications, are up-to-date with shots/worming and will have a Florida Health Certificate prior to leaving. Our puppies begin their lives with Bio Sensor, a early neurological stimulation program. Our puppies cost $2000. A $500 deposit will hold a puppy for you. Our puppies go to wonderful pet homes; some may go to homes who are looking for a dog to do obedience or agility; some are used as Emotional Support Animals. We would be happy to talk to you about the joy and responsibility of owning a Standard Poodle. If you are interested in adding a Boshi Poodle to your family or if you would just like to discuss Poodles in general, please give us a call, email, or via our contact form above.